At my age those "Now I have seen everything!" moments usually apply to weird and wacky videos and photos on the internet. This week, however, I actually learned something new about ancient Greece. Thanks to Greek Food by Sam(He used to write a good blog but now just Twitters occasionally: @greekfood) I discovered the Pythagorean Cup. Also known as a Tantalus cup it forces the user to drink in moderation only. If filled, it automatically siphons the entire contents out the bottom. Thus it can be used for practical jokes as well. 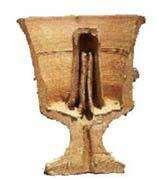 You might think this some modern gimmick using the ancient Greek theme but here is a photo of an apparently old cup. The photo is from Wikipedia where you also can learn more about how the cup works. Also shown are modern ones that you can find on Crete and Samos. Another reason to visit Greece!